Oh the love I have for soup! No joke I love soup more than any other meal…and that says a lot because I really love food. I literally can eat it every day and I pretty much do during the fall and winter months. It really is a perfectly well balanced meal for vegetarians. It warms your entire body and soul! Nothing is better than curling up on the couch with a blanket and a hot bowl of homemade soup. Or even better paired with a crisp salad for the perfect lunch! The key to any great soup is the broth you use. There a thousand different ways to make a vegetable broth and even more you can buy. I choose to make my own broth for many reasons. One it is super CHEAP you just use scraps from your vegetables, it takes no time at all, plus it’s fun to see what flavors come from a variety of vegetables and herbs. Most importantly you know exactly what is going into it. Broth becomes the base to all my soups so I know how much sodium and nutrients are already in there. I usually just throw whatever I have into a pot with some fresh herbs and get all I could want out of a it. However for some occasions like when I feel myself starting to get sick I make a broth with a purpose. 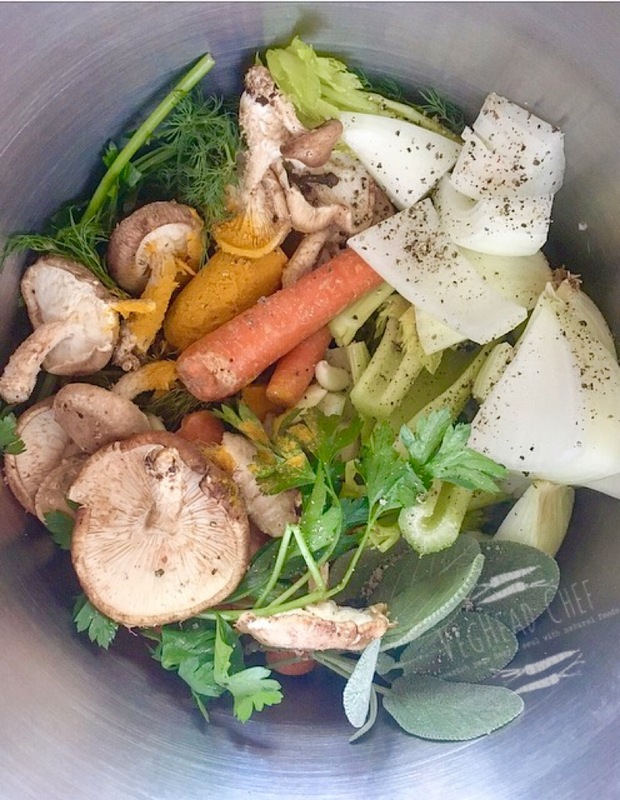 This Healing Broth is one of the few veggie stock recipes I live by. Place all ingredients in a large stock pot and bring to boil. Then simmer for 2-3 hours. With a very fine strainer or using cheesecloth strain broth 2-3 times. Store in air tight containers in fridge or freeze for up to 3 months. Flavors develop as you cook down the stock so always add salt little at a time. Most times I don’t even need salt until the very end. Remember your going to use this broth to make other soups which you then will add salt to. You can add all the fresh herbs and cloves in a sachet (cheesecloth tied with rope) to make the straining process quicker.